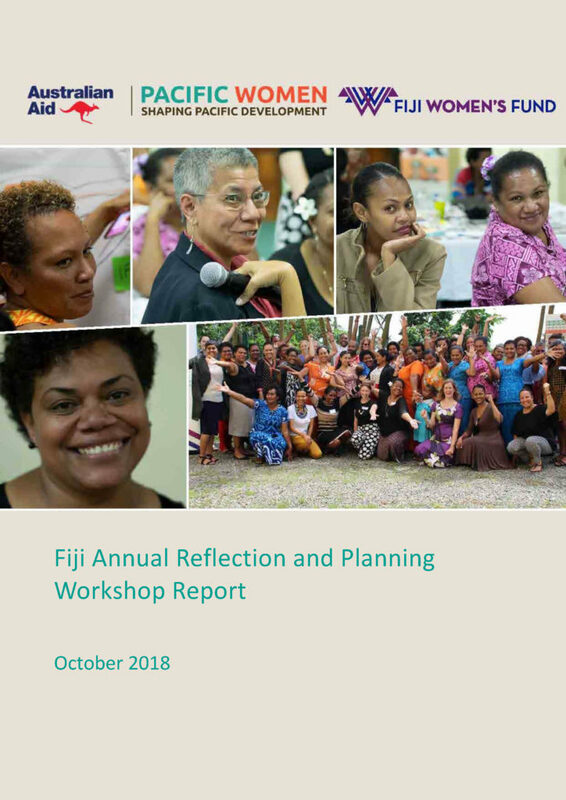 The Pacific Women Shaping Pacific Development (Pacific Women) Fiji country program and the Fiji Women’s Fund (the Fund) held an annual reflection and planning workshop for grantees from 24–26 October 2018. The workshop was designed to support partners and grantees in their work of advancing gender equality in Fiji and the region. ▪ facilitate stronger relationships between grantees, partners and other stakeholders. Over 40 participants attended from a range of women’s groups, organisations and networks. The attendees were partners of Pacific Women and grantees of the Fund. This report analyses the three key issues raised at the reflection and planning workshop. The first key issue is the current operating context of Pacific Women partners and the Fund grantees. The second issue is the strategies used by partners and grantees in response to gender equality issues. The third issue is achieving transformational change in support of gender equality. The report also documents skills building sessions and captures grantee feedback on the Fund’s operations.